A derma-roller contains hundreds of tiny needles. When in use, these needles create micro-injuries on the skin, which in turn sends collagen and elastin production into overdrive to compensate as it heals—leaving your complexion tighter and plumper than it was beforehand. This makes it an ideal method for filling in fine lines and wrinkles, thickening and plumping the skin under the eyes (thus diminishing the appearance of dark circles and bags), and even plumping up lips. 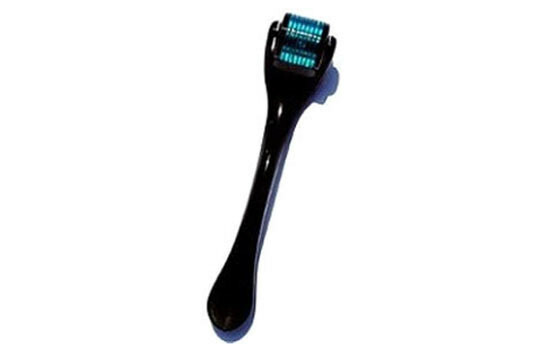 Micro-needling is also a very effective treatment for acne scars and discolouration since it penetrates the skin so deeply. Plus, when used in conjunction with a serum (as it should be), it boosts ingredient absorption by up to 90%. For a more intense, in-office treatment, many dermatologists use a derma-pen, an electronic micro-needling device that oscillates as it punctures the skin. These treatments often have immediate and dramatic results, but also have side effects like pain and bleeding. They also tend to be very expensive. Fortunately, at-home derma-rolling is a much thriftier alternative that still gets great results with regular maintenance. It requires a much lower pain threshold, too.